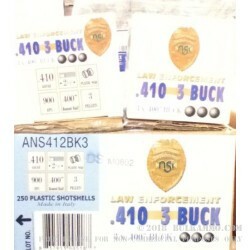 Nobel Sport Inc. is offering this impressive .410 3 Buck load that while it is branded as a Law Enforcement load, it’d be hard for most users to find any law enforcement outfit utilizing a .40 shotshell over say a 12 gauge for any number of reasons, not the least of which would be performance. All that said, this is an impressive round for those who have adopted the .410 gauge shotshell to a home defense or personal defense purpose. 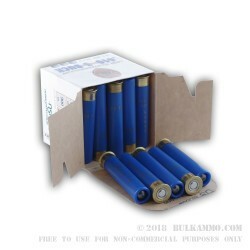 These are potent, proven rounds that offer great stopping power in a lower recoiling round for long guns, and in a higher performance round for handguns. 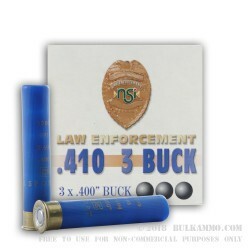 The 3 pellet load features 3 pellets of .400 buck which is a cold swaged shot that stacks in the shotshell, to offer the equivalent of 3 .40 S&W projectiles at a velocity of 900 feet per second, for a spectacular single shot stop for most threats in a home defense scenario. Nobel Sport is a company that has been at this game for a long time and has a proven production model and great distribution. Their volume is still low compared to some of the biggest in the world, but they do offer a very high end production methodology and have a very good production process.